Nae tae be confused wi Naples metropolitan aurie. The Metropolitan Ceety o Naples (Italian: Città metropolitana di Napoli) is an Italian Metropolitan Ceety in Campanie region, established on 1 Januar 2015. 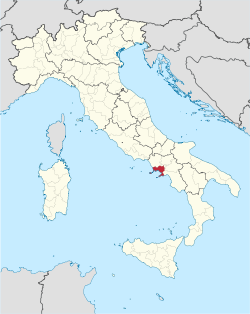 Its caipital ceety is Naples; athin the ceety thare are 92 municipalities. It wis first creatit bi the reform o local authorities (Law 142/1990) an then established bi the Law 56/2014. The Metropolitan Ceety o Naples is heidit bi the Metropolitan Mayor (Sindaco metropolitano) an bi the Metropolitan Cooncil (Consiglio metropolitano). Syne 1 Januar 2015 Luigi de Magistris, as mayor o the caipital ceety. Location o the Metropolitan Ceety in Campanie region. The metropolitan ceety o Naples haes some peculiarities that distinguish it clearly frae ither Italian metropolitan ceeties: besides haein a vulnerable seismic an volcanic activity, due tae the presence o Vesuvius an Campi Flegrei, its territory occupees anerly 8.6% the surface o the Campania (13,590 km²), an in it is concentratit mair than hauf o the entire regional population. This phenomenon o owercroudin haes creatit a strang demographic imbalance an territorial wi the fower provinces in Campanie. Tae get a clearer idea o its territorial limits, juist consider that the Neapolitan aurie is tae 96º place on 110 Italian provinces bi extension. Its aurie, 1,171 km² includin islands, in fact it is smawer than the surface o the anerly toun o Roum (1,287 km²). The substrate o the municipalities varies widely, rangin frae 1.62 to 117.27 km² o Casavatore km² o caipital; 60% o the municipalities are small (less than or equal tae 10 km²), 36% o middlin-sizit (> 10 km² an ≤ 25 km²), the rest (11%) mair than 25 km² an, o this, anerly twa municipalities (Acerra an Giugliano) are atween 50 an 100 km² an anerly the municipality o Naples exceeds 100 km². The population density of the metropolitan ceety amuntit tae 2,672 inhabitants / km², 12 metropolitan municipalities exceedin 50,000 inhabitants, in the leet o the tap 60 Italian municipalities that it includes three o the Neapolitan: Giugliano, Torre del Greco an Pozzuoli, while Casavatore is the first common in Italy for population density wi 12,000 inhabitants. / Km², follaeed bi Portici. Last Ptcp (Provincial Territorial Coordination Plan) showed that the urbanisit aurie is equal tae a total o 381.12 km² correspondin tae 32.54% o the total aurie o the territory, it follaes an effective framewirk tae densely populatit real climbin tae mair 8,000 inhabitants / km². At present it is very difficult tae distinguish the boondar line atween the mither ceety, adjynin auries an hinterland, completely weldit thegither intae ane agglomeratourbano seamlessly, baith in the vast aurie north (Giugliano, Afragola, Acerra an Nola) an in the Flegrea, Vesuvius an Stabia-Sorrento. The new Metro municipalities, giein lairge urban auries the admeenistrative pouers o a province, are conceivit for impruivin the performance o local admeenistrations an tae slash local spendin bi better coordinatin the municipalities in providin basic services (includin transport, school an social programs) an environs protection. In this policy framewirk, the Mayor o Naples is designatit tae exercise the functions o Metropolitan mayor, presiedin ower a Metropolitan Cooncil shapit bi 24 mayors o municipalities athin the Metro municipality. ↑ Craveri, Pietro (February 17, 2015). "Città metropolitana, lo statuto è di là da venire". Retrieved 25 February 2015. Wikimedia Commons haes media relatit tae Metropolitan city of Naples.